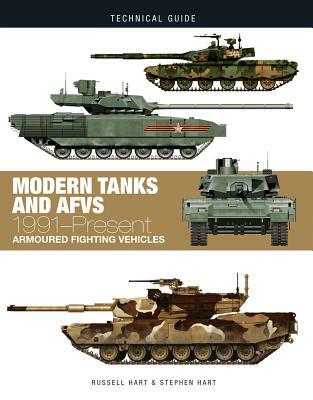 Organized chronologically by type, Modern Tanks offers a colorfully illustrated guide to the main armored fighting vehicles used since 1990. From the Gulf Wars to Afghanistan, Chechnya to the Crimea and Ukraine, Yemen to the Syrian Civil War, modern warfare has made strategic use of tanks and AVFS. Here's all every military enthusiast needs to know about those main battle tanks, armored personnel carriers, infantry fighting vehicles, self-propelled guns, and other vehicles. The examples discussed include the Chinese Type 99 main battle tank, the Korean K-2 Black Panther, the French VBCI infantry fighting vehicle, the Fennek reconnaissance vehicle, and the Russian T-14 Armata. Each profile includes authentic markings and color schemes, and every individual model features detailed specifications. Russell Hart is Associate Professor and specialist in modern military history at Hawai'i Pacific University and coauthor of German Tanks of WWII, Weapons and Fighting Tactics of the Waffen-SS, Panzer: The Illustrated History of Germany's Armored Forces in WWII, The German Soldier in World War II, and The Second World War, Part Six: Northwest Europe, 1944-1945. Dr. Stephen Hart is a Senior Lecturer with special responsibilities at the Department of War Studies, the Royal Military Academy Sandhurst. He has been published widely on military history topics, particularly British and German operations during WWII.